Shape: Irregular outline or silhouette, oval; pyramidal. 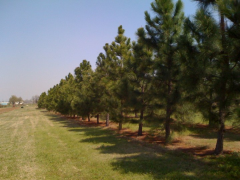 Comments: Slash Pine is self-pruning of its lower branches, is somewhat pyramidal when young and forms an open, rounded canopy creating a light, dappled shade beneath. This allows just enough sun to filter through for maintenance of a lawn beneath this tall, evergreen tree or for underplantings of dogwoods, azaleas, camellias and other plants which thrive in this high, shifting shade.